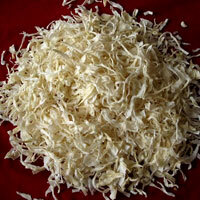 We are regarded as noteworthy Manufacturer, Exporter and Supplier of Dehydrated Onion Flakes in Mahuva, Gujarat. We offer a wide array of Dehydrated Onion Flakes such as Dehydrated Red Onion Flakes and Dehydrated White Onion Flakes. Both our Dehydrated Onion Flakes are made from excellent quality onions, and therefore are widely in demand. 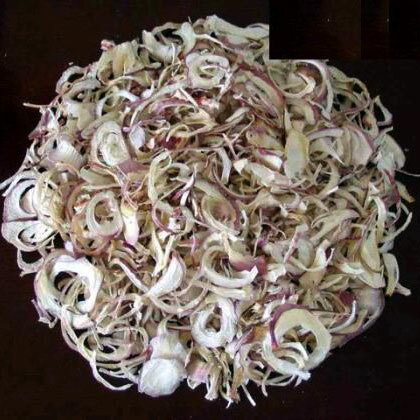 The right sorted varieties of the onions are received and that are peeled by removing the upper two layers. Then onions are washed with chlorinated water for cleaning, and then taken to the slicing machine causes 3mm thickness of slices. After slicing, these are again washed with water and taken to the drying machine. Dried material is taken to the sorted department where dried slices are sorted as per their categories like flakes, burnt onions, skins, cores, etc. The final moisture content of the flakes remains around five percent. Finally, sorted Dehydrated Onion Flakes are packed in 10 kg heat sealed polybags, and then stored in cool place before dispatch.